We came late to Cee’s “My Favorite Things” challenge, catching it in verse 2. While taking down the outside Christmas decoration a few weekends ago, we were delighted to see that the folds of a big velveteen bow had become home for one of our favorite insects: the ladybug. 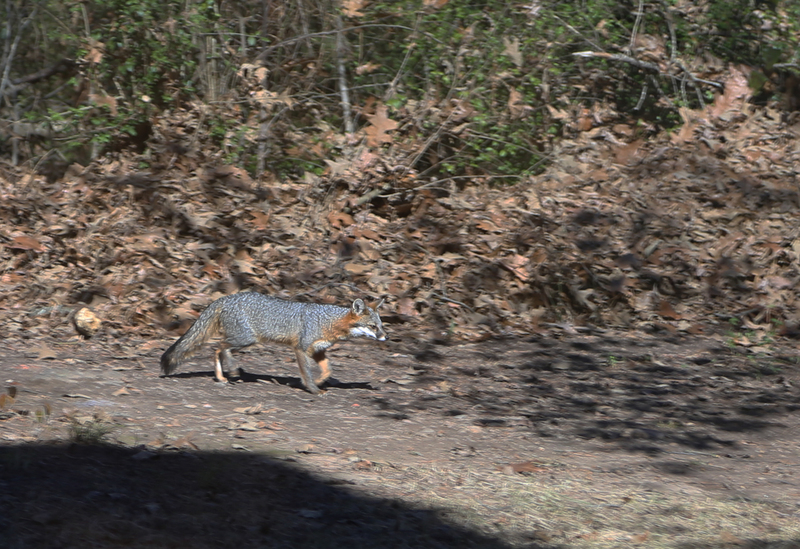 Twice a year, they appear by the dozens inside the house and outside, scores of them cover the warm sidewalks and walls. They are generally beneficial insects, chowing down on aphids, but have also been known to consume monarch larvae. 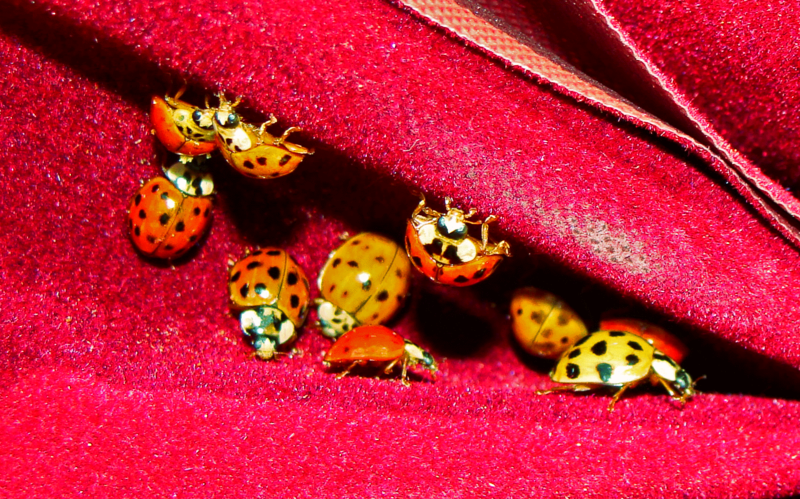 Read more about the multicolored Asian lady beetle: http://www.uark.edu/ua/arthmuse/asian.html. 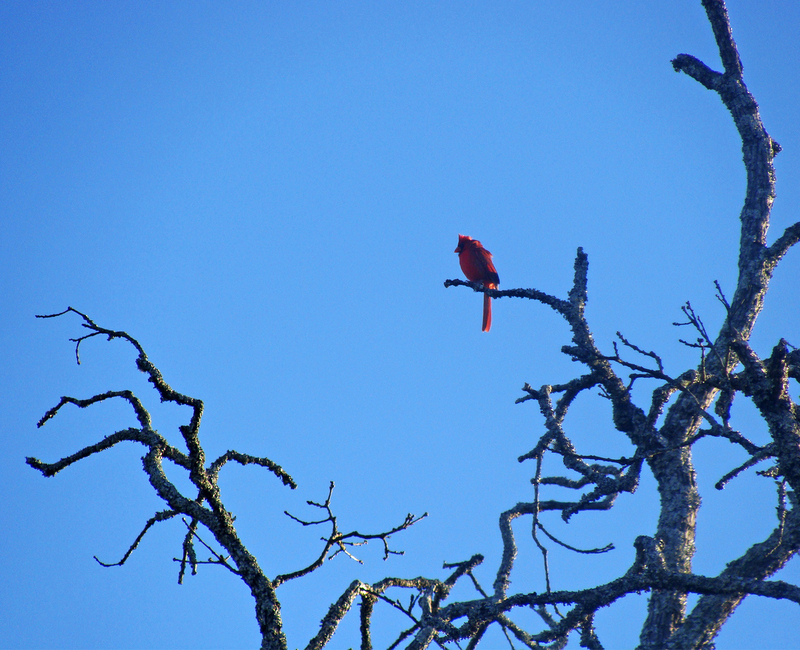 Cardinal on overwatch in the backyard. The Weekly Photo Challenges seem to be getting, well, more challenging. 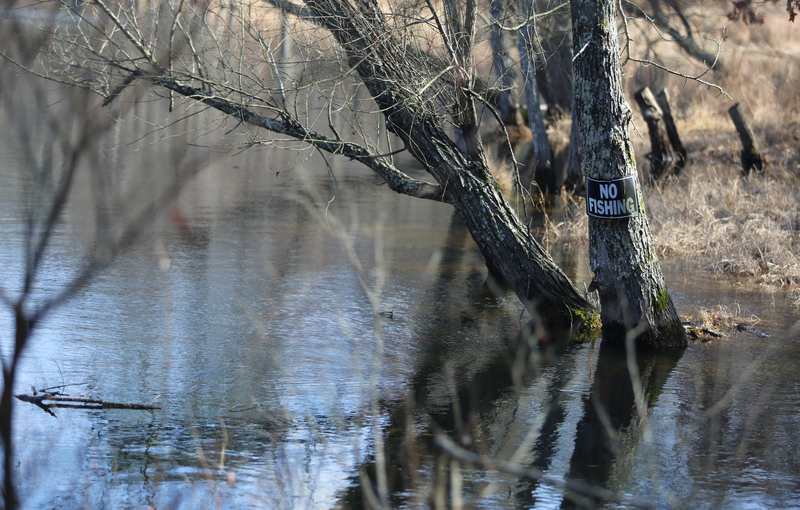 This week’s theme is “Express Yourself.” This image is not so much about what the sign says, but how out of place its expression seems in a place where the only anglers are birds. Finding serenity any time is a challenge, and this week it IS the challenge. For the last few weeks, I’ve been trying to capture the latest comet Lovejoy in pixels. 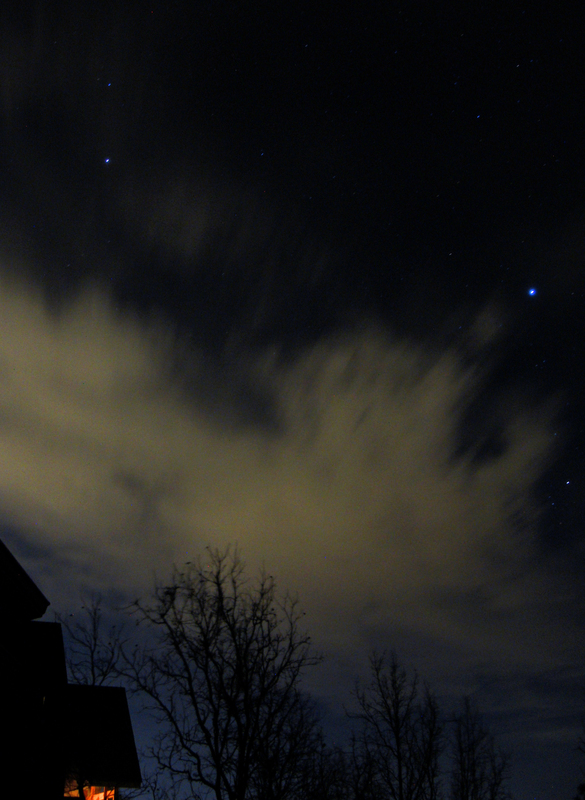 Tonight’s effort was flustered by clouds, but one shot — a test shot setting up — seemed to hit all the right notes. The soft light in the cloud, the familiar pinpoints of starlight and the warm glow coming from the house next door all seemed to be a little bit of serenity. 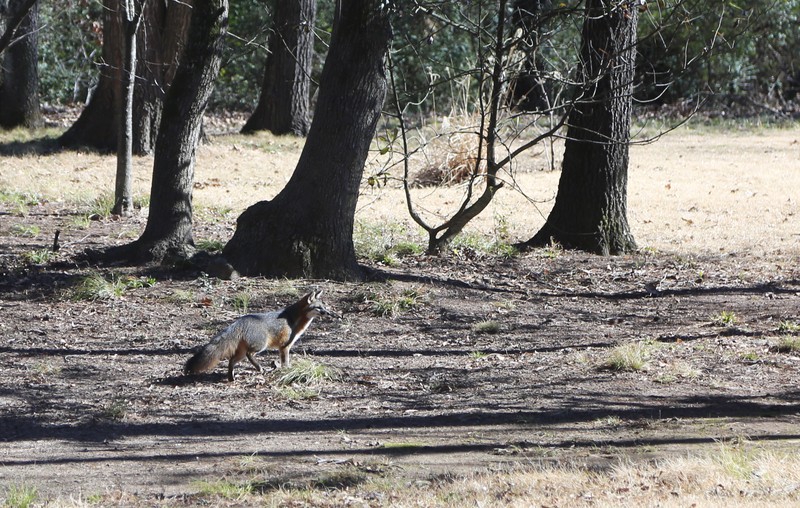 Not a great photo, but liked the somewhat wacky composition. 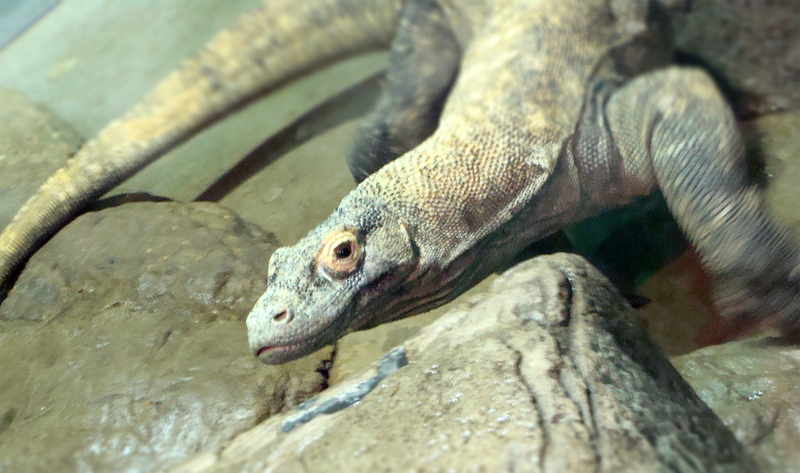 Komodo dragon heading for his favorite rock in his zoo habitat. 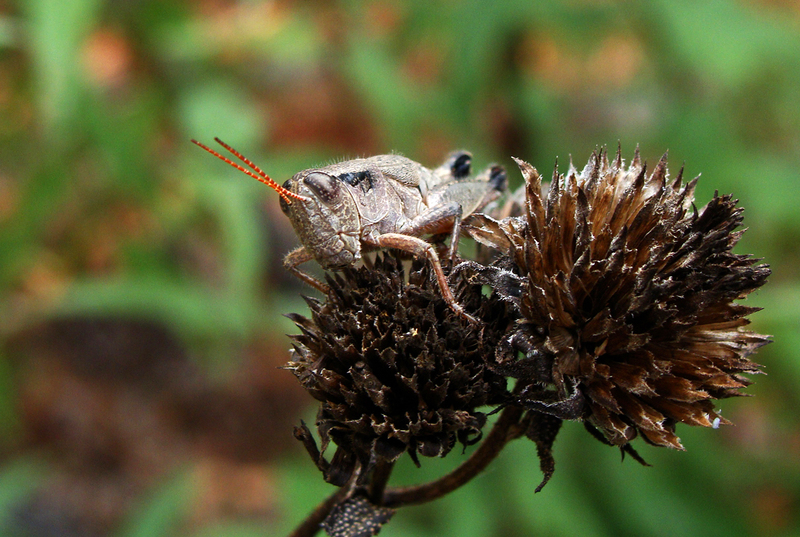 Grasshopper lounges and eats from the top of a sunflower seedhead. The probability of pine needles landing more or less vertically seems to me to have the about same probability of a tossed coin landing on its edge. Which is why this sight grabbed my eye. 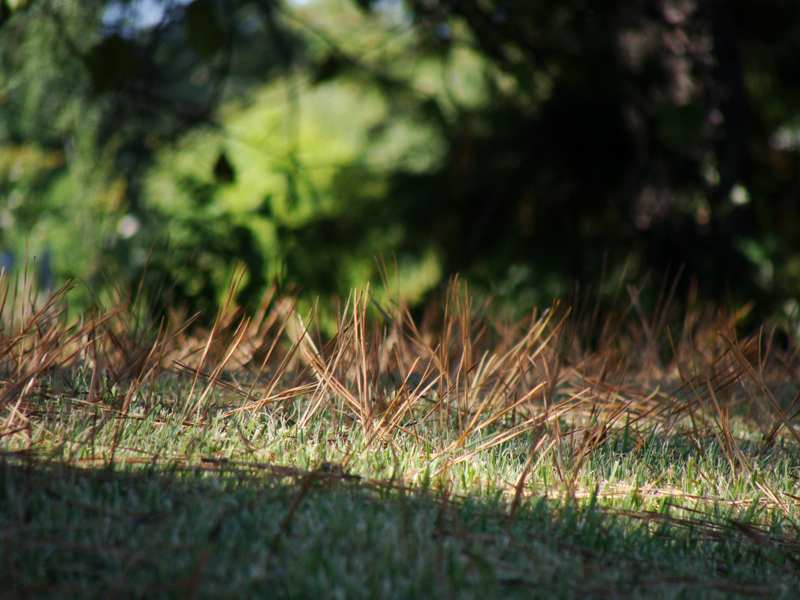 A green swath with pine needles landed heads down, sticking up from the grass like a little forest of lawn darts. Alas, the lawnmower man came by the next day and the needle forest was gone. Needles sticking up from the grass. A Daddy Long Legs enjoys breakfasting on a wolf spider (I think), while a parasitic red mite enjoys same on the daddy long legs. Harvestman chews on a wolf spider for breakfast. While shooting art for an article about bee research, there appeared this gem, tucked away in a tangle of giant ragweeds, passion vines, morning glories and johnson grass, on an old farm road in Lonoke County, Arkansas. Faded, but still beautiful. 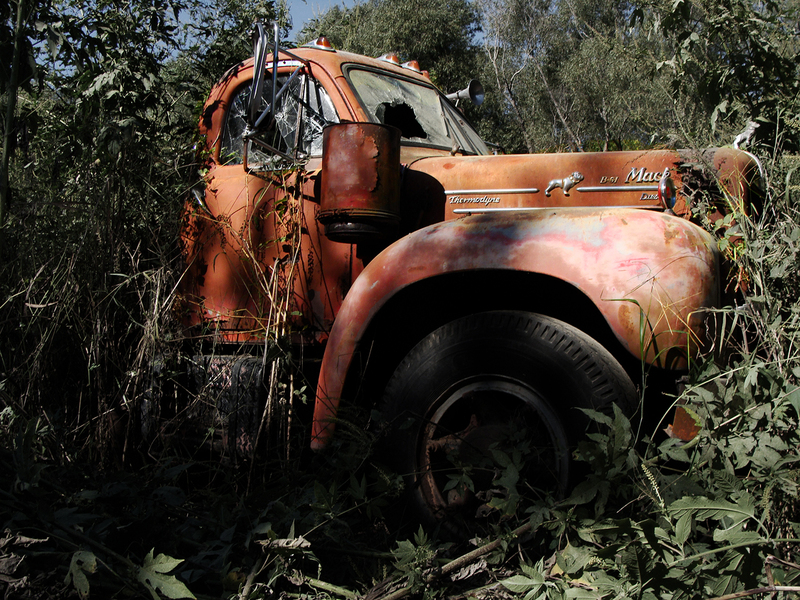 This Mack truck is being reclaimed by nature.